If this hadn't been caught on camera, we'd never have believed it! This man is a true example of how you should get up and dust yourself off after an unexpected force knocks you down – only, he did this literally! Simon Smith (53) was sent flying through the streets of Reading, England, when a bus hit him from behind. The impact of Simon’s head hitting the window of the bus was so bad it left the window badly smashed. 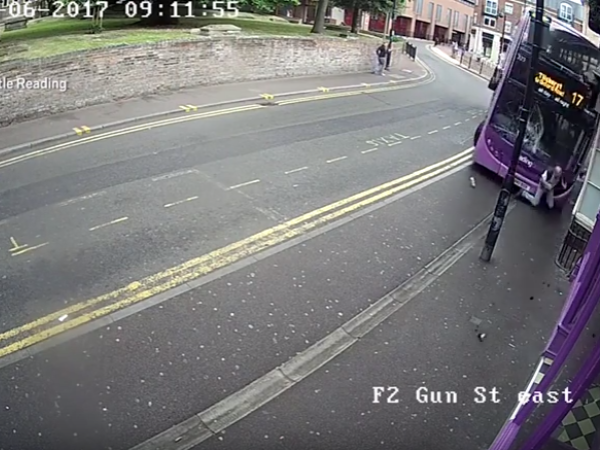 CCTV footage captured the incident, which took place on the morning of 24 June, showing the bus steeply taking the turn at the beginning of the road. It continues driving at what seems to be an uncontrollable speed through the street until the driver eventually loses control and diverts onto the side of the road, knocking Simon from his feet and thrusting him forward. The crash leaves debris strewn all over the pavement and on the road. But miraculously, Simon is virtually unscathed as he gets up and walks into the nearby pub. “I hadn’t lost consciousness so I knew what had happened," he told The Sun. “But the police and paramedics didn’t believe me. “Originally they were all in agreement because if I had been hit by the bus, I wouldn’t be here. I said ‘I’m sure the bus hit me’ and they kept saying ‘No you were hit by debris’. “An officer then saw the CCTV at the pub and came back and said ‘I’m really sorry, you were right’." According to the Thames Valley police, no arrests have been made and it’s unsure what exactly caused the crash. The bus company responsible for the incident said it’s investigating the ordeal.